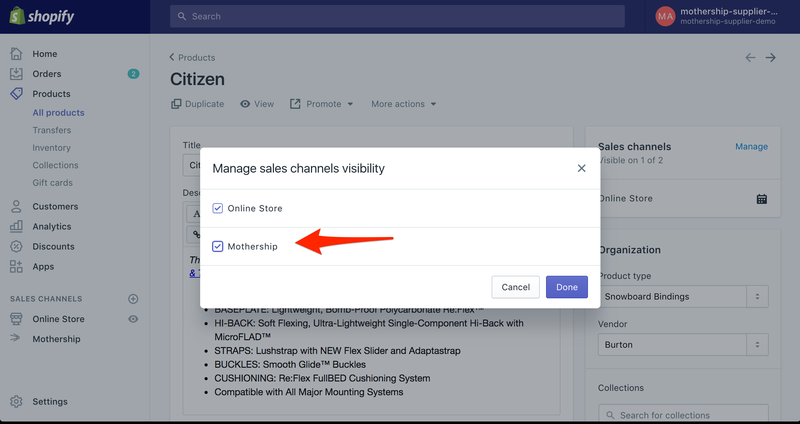 Mothership is a sales channel in Shopify in the same way that your online store, POS, or Facebook store is a sales channel. The most important part of being a sales channel is that you need to select the products and collections that you want to make available to your retailers through Mothership. You can publish all of your products, some of your products, or none of your products to Mothership. Additionally, since Mothership uses the concept of a product catalog, you can further refine the availability of products and collections to different retailers. Lets say you publish products A & B to Mothership. You can set up a product catalog that includes both A & B and assign retailers 1 & 2 to the catalog. 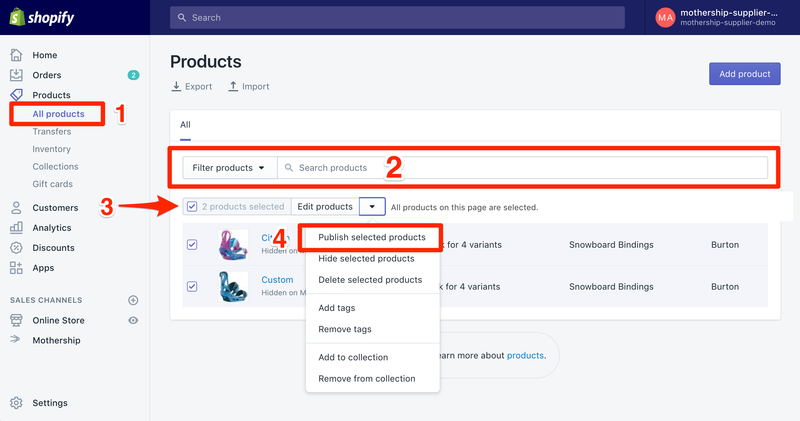 You can also create two different catalogs, include product A to one and product B in the other, and then assign retailers to the product catalogs such that retailer 1 only has access to product A and retailer 2 only has access to product B. To publish a product to Mothership, go to the product's configuration page in the Shopify admin panel. Click on the manage link in the sales channel box in the upper-right hand corner of the screen. Ensure that Mothership is selected and then click 'Done'. Finally, click on the 'Save' button at the top. 1. You can also publish multiple products to Mothership by clicking on the 'All products' link under the products header in the left-hand menu (step 1 below). 3. Next, click the checkbox pointed to by the 3 above to select all of the products or all of the products in the search results. Note, if you searched for products and Shopify returned more than 50 results, you will need to click the select all results link to include all of the search results. 4. Click the drop down button next to edit products. Click 'Publish selected products'. Ensure that Mothership is selected in the dealog window and then click the purple Publish Products button. You also publish your collections in the same way you publish products, both individually and in bulk. Collections are also made available in product catalogs in a manner similar to products.